The Bush Stone-curlew or Bush Thick-knee (Burhinus grallarius), is a large (55 to 60cm wingspan), ground-dwelling bird endemic to Australia. Although it looks rather like a wader and is related to the oystercatchers, avocets and plovers, it is a terrestrial predator filling an ecological niche similar to that of the roadrunners of North America. 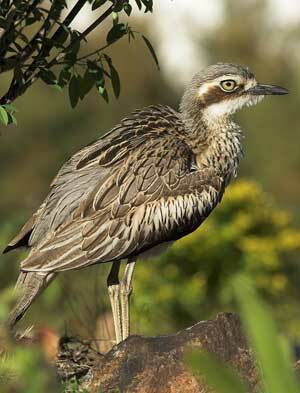 Bush stone-curlews remain reasonably common in the north of Australia but have become rare in the less fertile south. The bush stone-curlew has a broad habitat preference, it can be found in open forest, eucalyptus woodland, rainforest edges, grassy plains, arid scrub land and along inland watercourses. It is still abundant in the tropical and sub-tropical north, however numbers have declined in southern parts of its range. Like most stone-curlews, it is mainly nocturnal and specialises in hunting small grassland animals. Gleaning or probing soft soil or rotting wood as well as snatching visible prey. Birds usually forage individually or in pairs over a large home range.